Planning for New York City’s Second Avenue Subway began in 1920. Almost one hundred years later – after failed starts and financial woes – the first phase’s three new stations finally opened on January 1, 2017. With so many who thought they would see it open in their lifetimes only to be disappointed, I was not about to let the day pass without being part of that grand opening. I was not alone. New Yorkers and tourists alike all turned out to see the fruits of the labor of so many. There were also a lot of staff from the Metropolitan Transportation Authority welcoming us all to the shiny and art-filled new stations, and passing out commemorative subway maps and brochures. Whether it was the new rails or sheer exhilaration influencing my senses, the trains glided smoothly, elegantly, and quietly into these new stations. And whether it was the excitement of seeing this project finally come to fruition, or relief that an atrocious 2016 was now behind us, there was a palpable sense of optimism and good cheer. These photos follow my path as I first traveled uptown to 96th Street, the terminal station, and then stopped at each of the other two new stations on my way back downtown. 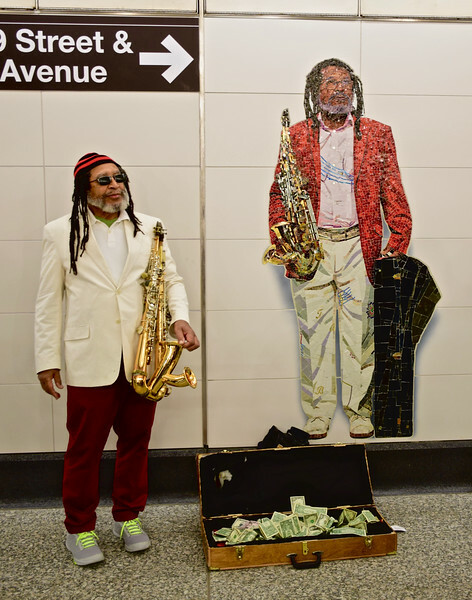 For some of the artwork, I also captured signage in the shot to show where they can be found since a journey on New York’s subway system is not unlike a tour through a museum.